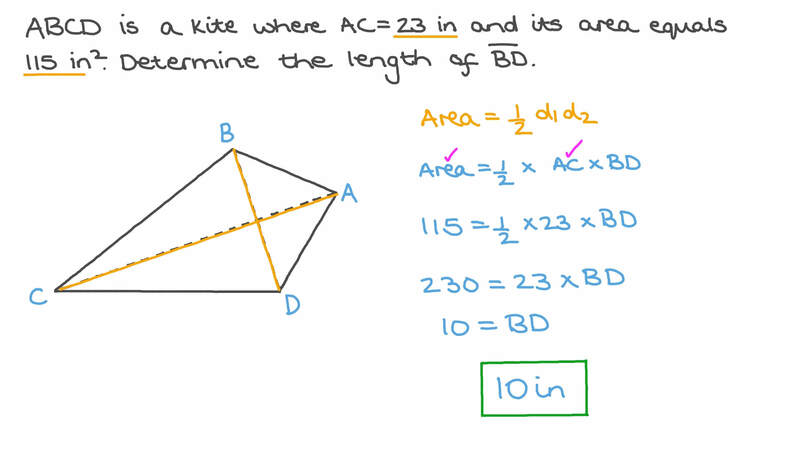 In this lesson, we will learn how to find the area of a kite in terms of its diagonals' length. Given 𝐴 𝐶 = 4 5 and 𝐵 𝐷 = 3 1 , find the area of the kite 𝐴 𝐵 𝐶 𝐷 .
𝐴 𝐵 𝐶 𝐷 is a kite where 𝐴 𝐶 = 2 3 i n and its area equals 115 in2. Determine the length of 𝐵 𝐷 .
𝐴 𝐵 𝐶 𝐷 is a kite, where 𝐴 𝐵 = 9 i n , 𝐵 𝐶 = 7 i n , and 𝐵 𝑂 = 6 i n . Determine the area of the kite to the nearest tenth. What is the area of the given figure to the nearest tenth of a foot? Find the area of the shaded region. 𝐴 𝐵 𝐶 𝐷 is a kite where 𝐴 𝐶 = 2 3 i n and its area equals 230 in2. Determine the length of 𝐵 𝐷 .
𝐴 𝐵 𝐶 𝐷 is a kite where 𝐴 𝐶 = 2 0 i n and its area equals 100 in2. Determine the length of 𝐵 𝐷 . Given 𝐴 𝐶 = 4 7 and 𝐵 𝐷 = 4 0 , find the area of the kite 𝐴 𝐵 𝐶 𝐷 .
𝐴 𝐵 𝐶 𝐷 is a kite, where 𝐴 𝐵 = 3 i n , 𝐵 𝐶 = 4 i n , and 𝐵 𝑂 = 2 i n . Determine the area of the kite to the nearest tenth. 𝐴 𝐵 𝐶 𝐷 is a kite, where 𝐴 𝐵 = 5 i n , 𝐵 𝐶 = 8 i n , and 𝐵 𝑂 = 4 i n . Determine the area of the kite to the nearest tenth.